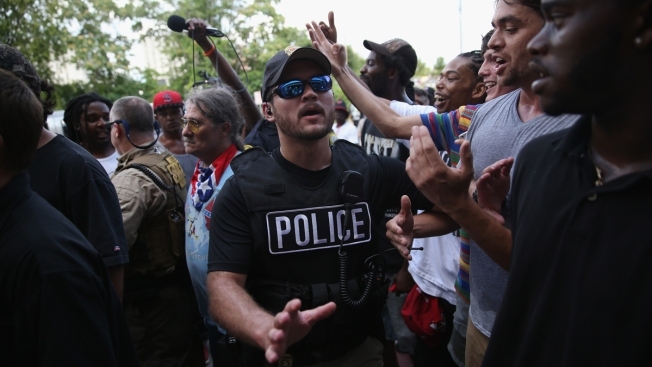 This July 18, 2015, file photo shows police in Columbia, South Carolina, restrain protesters as Ku Klux Klan members depart the state capitol building after a demonstration over the removal of the Confederate flag from the capitol grounds. The possibility of gunfire at the incident led the mayor and city to defy state law and ban guns around the statehouse. A Southern mayor is helping to lead a movement among local governments to create "gun-free zones" and otherwise limit gun stores and certain kinds of firearms, NBC News reported. That's despite laws in 43 states preventing municipal governments from passing local gun regulations that go further than state ones. Second Amendment-supporter Stephen Benjamin began to change how he thought about gun regulation ahead of a face-off between the Ku Klux Klan and New Blank Panther party over the removal of the Confederate flag from the South Carolina Capitol in 2015. Benjamin, mayor of Columbia, feared a gunbattle, so he and the City Council banned firearms from the area around the statehouse — no one was shot. "The failure of the Congress to pass policies that keep our communities and children safe means towns feel compelled to act," Benjamin said. "We don't have to accept the carnage."